About twenty years ago at a family Christmas celebration, Jim's grandmother gave each of her granddaughters (and granddaughters-in-law~me) a teacup/saucer from her personal collection. At the time it was decided that we would get together and have a tea party with our "new" teacups. Well, we're a little late, but we finally did it a couple of weeks ago! This is the teacup I was given. Isn't it pretty? YIPPEE! Thanks so much Kim!!! I still love them; they're so cheerful:) Isn't the little cow creamer cute?!? Since I had some of my homemade sugar cookie dough available that's what I used. I did make the tea bag cookies thinner than my usual sugar cookies, but even thinner might look more authentic, as Lorraine suggested. A real tea bag was used to measure the size of the cookies and I used a ruler to cut out a long strip of dough marking the bottom and top with the tea bag. After that I marked the width of each with a sharp knife using the tea bag as a guide once again. After I transferred all the dough rectangles to the baking sheet, I held the tea bag on top of each to use as a template in cutting off the the angled corners at the top of each cookie. Lastly, to make the holes, I used a decorating tip-#12. I knew the holes would close up a bit while baking, so I placed the unbaked cookies (on the baking sheets) into the freezer before baking for 10-15 minutes. Twine was doubled and looped through the tea bag hole and the two ends were tied together into a small knot. Just below the knot the twine was centered onto a piece of decorative tape, which was then folded over to secure it. You may add the twine/tape before or after dipping them in chocolate. To make the "tea", melt some chocolate chips in a small, deep bowl, add about a tablespoon of shortening, and dip the cookies a little less than halfway in. Set on wax paper to dry. Hello, I would really love to know what the brand or name of the blue and white pattern? It's gorgeous and would love to find some for myself! By the way, love the cookies! 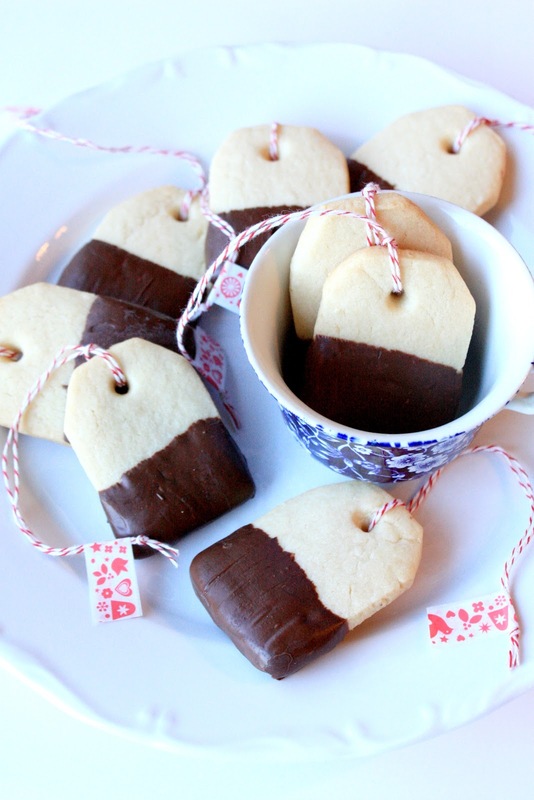 I showed my partner who said 'so, they're teabags' lol Will definitely be making these! Nevermind!! I just re-read the post. Silly me!! I have this set. my mom had them, and now they are mine. I never ever use them.. they are in the china cabinet I also got when she passed away. everyone that sees them. loves them. I will never get rid of these little beauties. Totally love these. they've been on my list to make, too. I'm an avid tea drinker. I love your china collection too, that rolling pin is quite a catch. I've never seen one like that. I noticed that I actually commented on your post way back in 2010, pre Pinterest:)Oops! Sorry, Kim. Hi Kim, I didn't get the original photo creator and there was no mention of your blog. I always give credit if I know where it came from. I also find that ideas of mine pop up all over the internet later without credit so I know how annoying it is. But as Sue mentioned, the internet is vast and it is very hard to pinpoint the actual originator of many ideas. Sue, these are so cute. I've had these on Pinterest forever but have not made them yet. Now I'm really wanting to make them! LOVE them! Would love your sugar cookie recipe! Such cute cookies. I love your blue calico. THose would never go "out of Style". I was married in the early 80's and wish I had chosen your pattern instead of the rather trendy rough and masculine pattern I picked. I got rid of them (passed them on) twenty years ago. THEY WERE UGLY and "What were we thinking"?!!!! 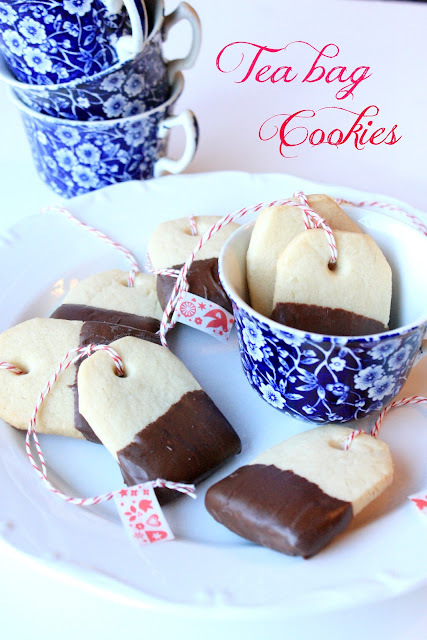 What a sweet story and the tea bag cookies are so very sweet too! With three girls of my own, I should be able to find reason to rustle up a tea party! 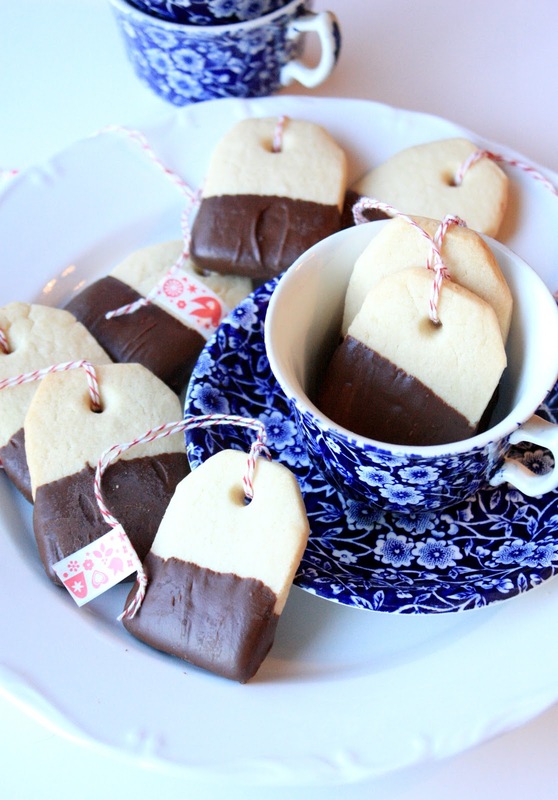 The idea of tea bag cookies is so appropriate for a tea party! They are new to me and I will be making them for my sister-in-law's Christmas tea! Thank you for sharing. You amaze me everytime with your cookies, Sue. These are so much fun. I love how they are dipped in chocolate, too. What a fun cookie creation! And I LOVE the blue teacups, They are gorgeous!! Adorable! I love the calico dishes as well. I'm loving all of your blue dishes. So elegant and these cookies are perfection! Those look really easy and how fun for a tea! I had to look back. Love, love, love Mummy and her little Monsters! They are so fabulous. I have been a little slow to make my rounds but I had to make this top priority today - you know I would LOVE these TEA TIME cookies! SWOON x INFINITY. It would be even better to share these over some real tea with YOU someday, that would be awesome! I'd love to have you join my Pin Me Linky Party that starts Friday at 8am CST because these are amazing! I'm going to pin it now! I am following you via GFC, Facebook & Pinterest now! Please check if thats ok with you. These are adorable, I have a friend who loves tea and would LOVE these! The tea bag cookies are adorable! I LOVE LOVE LOVE your china set, especially the matching rolling pin. Just beautiful!!! these are so cute!!! perfect for a tea lover. I'm in love with this idea! So very lovely. Pinning! What an amazing idea, so creative, almost too cute to eat, but I will be trying them none-the-less. I love the story, the dishes, and the darling cookies!! I love the details you added the twine and tape make them extra special. You are incredibly talented Sue! Happy Anniversary to you and your hubby. I'd love to see them, Avril!